The posting that follows is not a history of the North Pacific Coast Railroad or its successors, the North Shore Railroad and the Northwestern Pacific. Rather it consists of a few glimpses of the wondrous line as it evolved over 58 years and then for the most part faded away. More than half the towns in West Marin grew up along the tracks of the North Pacific Coast narrow-gauge railroad. In 1875, the line opened between the Sausalito ferry terminal and Tomales by way of Point Reyes Station. Soon it was extended to Cazadero’s logging camps. The narrow gauge makes a morning stop in Lagunitas around 1915. By then, the tracks east of Manor (now part of Fairfax) had been converted to standard gauge with an electrified third rail powering the locomotives. In order for trains to travel between the San Geronimo Valley and Manor, the narrow gauge required two tunnels to get through Whites Hill: “a small one at the bottom behind White Hill School and the longer one at the top, which passed directly under the current [Sir Francis Drake Boulevard] pass,” historian Dewey Livingston of Inverness told me. These were replaced in 1904 by the Bothin Tunnel on the south side of Woodacre. The Bothin Tunnel was sized to accommodate standard-gauge railroad cars, which in 1920 took over the stretch from Point Reyes Station east to Manor. After the standard gauge shut down in 1933, the Bothin Tunnel remained open — primarily for fire engines from the county fire department in Woodacre en route to fires in East Marin. After many years, however, the Bothin Tunnel was closed by a fire and cave-in, Livingston added. A northbound train crosses the Point Reyes Station trestle. A particularly wretched part of the line was this trestle over Papermill Creek immediately east of Point Reyes Station. A sharp curve in the tracks just west of the creek was followed by a reverse curve on the trestle itself. On June 21, 1903, one of the worst wrecks in the railroad’s history occurred at the trestle. A special train had been chartered to carry friends of Warren Dutton, a founder of Tomales, to the town for his funeral. Returning southbound, the train, which had been traveling fairly fast all the way from Tomales, crossed the trestle a little too fast. The engine and its coach fell off the trestle and landed upside down, killing two passengers. Four other passengers and the conductor were badly injured. Just three days later, another train ran off the tracks in nearby Tocaloma, crushing the engineer beneath the cab. Three years later, the Point Reyes Station trestle experienced more misfortune when it was severely twisted (left) by the 1906 earthquake. The trestle, however, was quickly repaired. Similar damage occurred in Tomales and along the railroad bed beside Tomales Bay. As the late railroad historian Bray Dickinson of Tomales noted in his 1967 book Narrow Gauge to the Redwoods, “Anticipating a big summer business, the narrow gauge company intended to start a new schedule on the day of the earthquake. In Tomales, the quake caused a hillside to collapse, tangling the tracks. In the railroad’s early days, Tomales was the most prosperous West Marin stop, and nearby hamlets were also bustling places. Here a giant round of cheese awaits being picked up in 1894 at the train platform in Fallon. In the 1890s, Engine 13 wrecked at Clark Summit just north of Fallon. The site is now part of Clark Summit Farm, an organic beef, pig, and chicken operation owned by Liz Cunninghame and her husband Dan Bagley. Nowadays, most motorists on Highway 1 south of Tomales are familiar with these steel piers, which once held up a trestle spanning Keys Creek. Far fewer people, however, have any idea how the trestle looked when it carried trains. In fact, remnants of the old railroad provide only a hint of the grand system it was. For motorists heading north on Highway 1 from Point Reyes Station, the first turnout where they can stop and view Tomales Bay overlooks what was once a commercial area known as Bivalve. This long-gone oyster building was Bivalve’s dominant structure. North of Bivalve, the old railroad bed along the shore is barely discernible these days. In railroad days, however, this approach to Bivalve was a scenic part of the trip. South of Bivalve, the railroad bed skirted a small lagoon as it crossed to Railroad Point on Martinelli property. I know the spot well, for the late Sheriff’s Capt. Art Disterheft and I were once kayaking in the lagoon when we discovered we were virtually trapped by a strong incoming tide through the entrance channel (foreground at right). We finally escaped by paddling frantically only to then hear someone on the turnout above us laughing loudly at our predicament. The photo at right of a southbound train leaving Bivalve en route to Railroad Point was shot in June 1906. “This was two months after the great earthquake, which badly damaged this section of line along Tomales Bay,” Dickinson noted. Although the tracks heading east from Point Reyes Station were converted to standard gauge in 1920, the tracks north of town remained narrow gauge. In 1930, the narrow-gauge section shut down, and in 1933, the standard-gauge section did too. Much of the material for this posting comes from Dickinson’s book Narrow Gauge to the Redwoods. 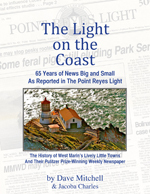 Anyone who lives in West Marin and is interested in its history should have a copy. The book was edited by historian Ted Wurm, who died in 2004, while most of its photos are from the late Roy Graves’ collection. i grew up on Bodega Ave. near Tomales and loved our trips west to Tomales Bay. Have a strong memory of riding along Tomales Bay around 1940 as a little girl with my great Aunt Frances and listening to her tell about the railroad that she remembered. I grew up in Santa Rosa and worked summers and weekends at a camp just beyond Camp Meeker along Dutch Bill Creek. A trestle had crossed the creek on the property and about 1/4 mile further north was a tunnel that was open when I was a kid and attending the same camp. My mother lived in Occidental for about a year circa 1919 with her brothers and sisters after her mother died in San Jose. She remembered walking across a long high wooden trestle between Occidental and Freestone – to and from school. She claimed it was the highest wooden trestle west of the Mississippi (??) I thoroughly enjoy tracing the old right away when driving the roads from Tamales through Freestone, etc. Forgot to mention that a spur siding came off the line down to a lumber mill on the west end of the trestle where the summer camp, Westminster Woods, is now located. Spent many a happy hour scouring the woods for artifacts, bottles, etc. One partial sign I picked up is now with the Sonoma County Museum in Santa Rosa – warning people not to cross the trestle. to venture through the tunnel in the early 50s. Occasionally a truck would be sent to locate and send home the miscreants. The tunnel was so long that if you hadn’t brought your bike, there was a good chance of avoiding being caught by hiding between the wooden upright supports. Evidence of the trestle crossing Papermill Creek probably still can be found in the shrubbery where the two Woodacre branches of the stream joined at the base of Dickson ranch where Redwood Drive joins the old highway. Sparsely Sage and Timely is powered by	WordPress 4.9.10 and delivered to you in 0.683 seconds using 56 queries.